~ A place to find your sweet spot – in style, in savings, in solutions, in sanity. I’ve been lucky enough to live in climates where I can grill year round. Frankly, even if I found myself in North Dakota in December, I’m sure I’d find a way to slap something on the grill. It’s among my favorite cooking methods. 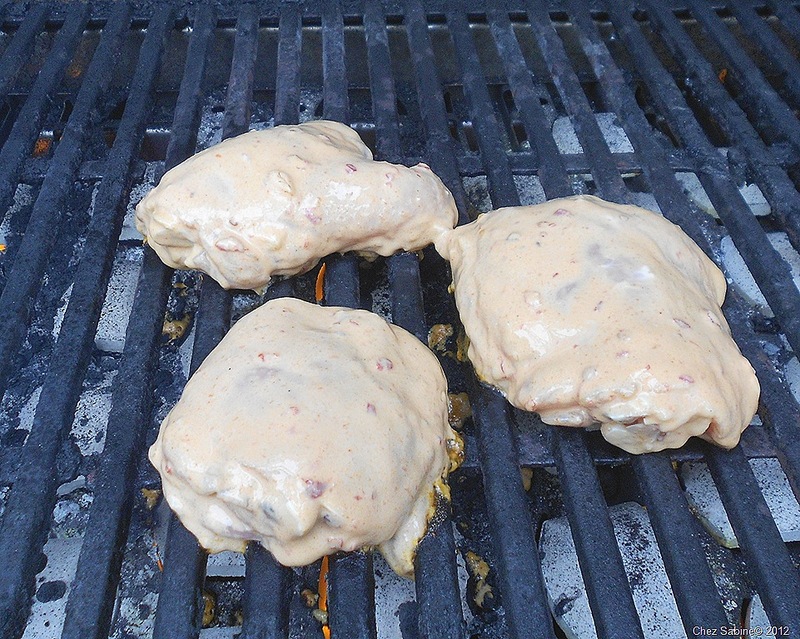 But hitting the grill that often means that I have to be on my toes when it comes to sauces and marinades so that I don’t end up using the same ole same ole too often. Smoky barbecue sauces and traditional marinades are fine, great even, but sometimes you need to switch it up. And I’m all about that. I hope you are, too. 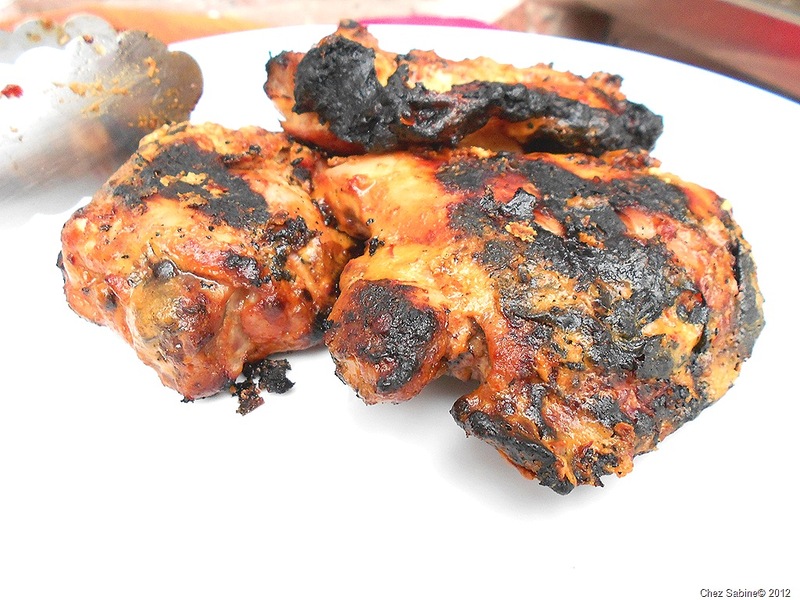 And that’s why I want to share a really simple but versatile marinade that will net you absurdly juicy, highly flavored grilled chicken. I’m going to give you the basics in the hopes that you’ll run with them and put your own spin on this recipe. And if you don’t, and end up making it exactly as I show you, well, you’ll still be rewarded with a terrific dish. 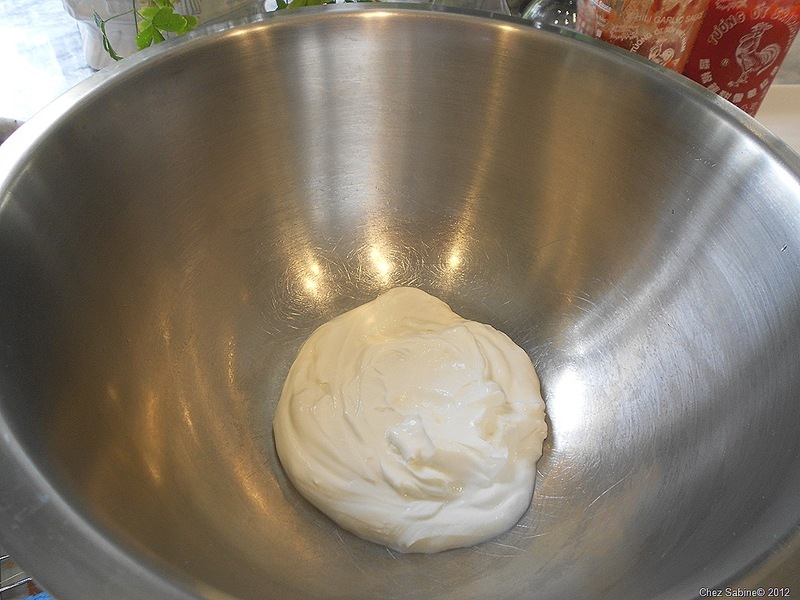 Rather than using an acid-based marinade (think wine, citrus juice, vinegar) or an enzyme-based marinade (think kiwi, pineapple, papaya), I’m going to use plain non-fat Greek yogurt as my base, which makes an excellent tenderizer. Plus, the yogurt’s neutral flavor acts as a perfect foil for all of the spicy additions I’m tossing in. 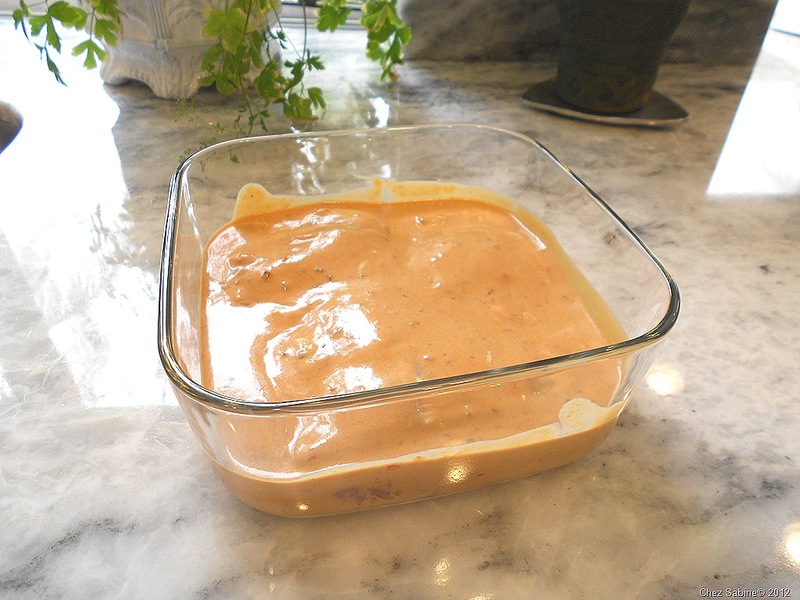 And since this is a thick marinade, it sticks to the chicken so you don’t have to worry about flipping the meat over as it marinates in the refrigerator. 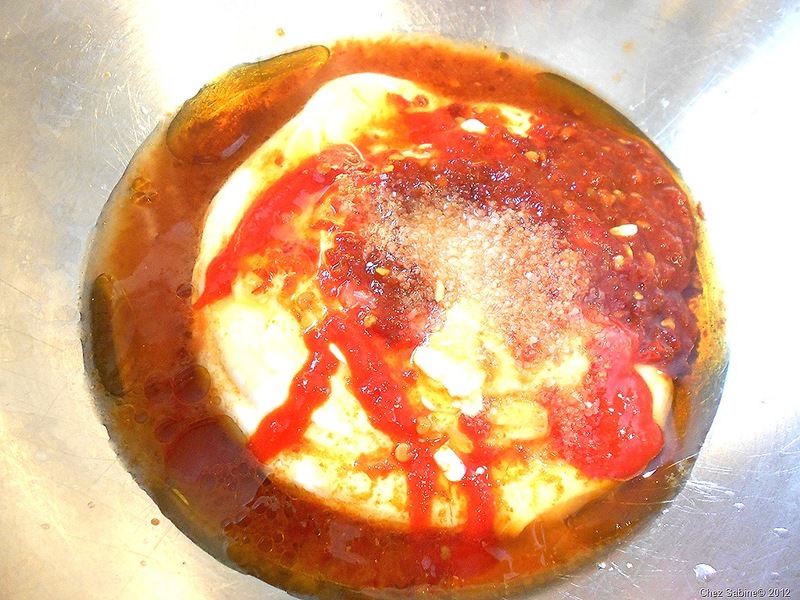 All of the marinade ingredients have been added, Jackson Pollock style. * So, here’s the fun part. 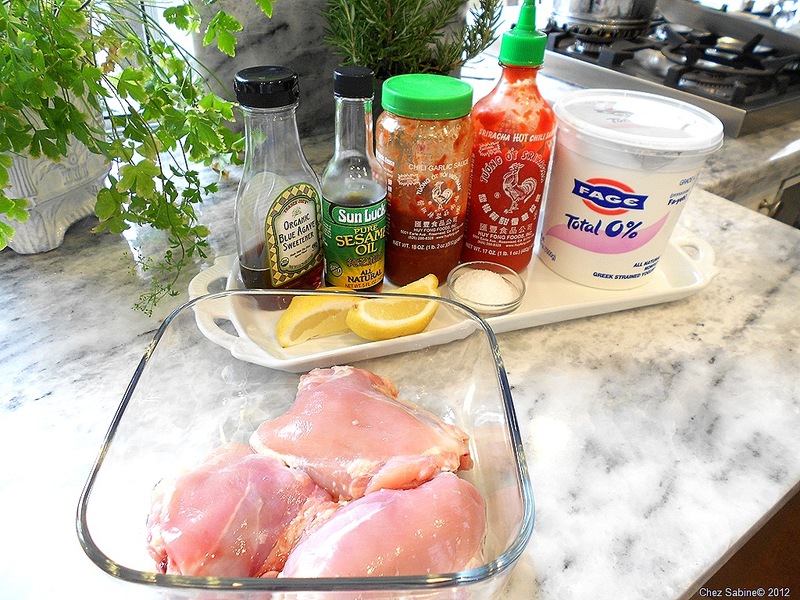 You can ratchet this marinade up or down as you like. But I want you to consider a couple of things if you’re not used to putting seasonings together willy-nilly, which is my favorite way. 1. Feel free to use prepared seasonings but watch carefully that they’re not loaded with salt or you’ll end up with a briny marinade that will be a major culinary buzz kill. 2. Keep some semblance of flavor balance in mind as you season. For instance, I added an element of sweetness because I have a fair amount of heat going on, as well as the tartness from the yogurt and the lemon. OK, along with adding, you also can subtract flavors you don’t like or those that might not go with your mood. Don’t like spicy? Ditch the Sriracha sauce. Swap out the sesame oil for olive or any other oil you like. But do use a little oil since you’re using non-fat yogurt. 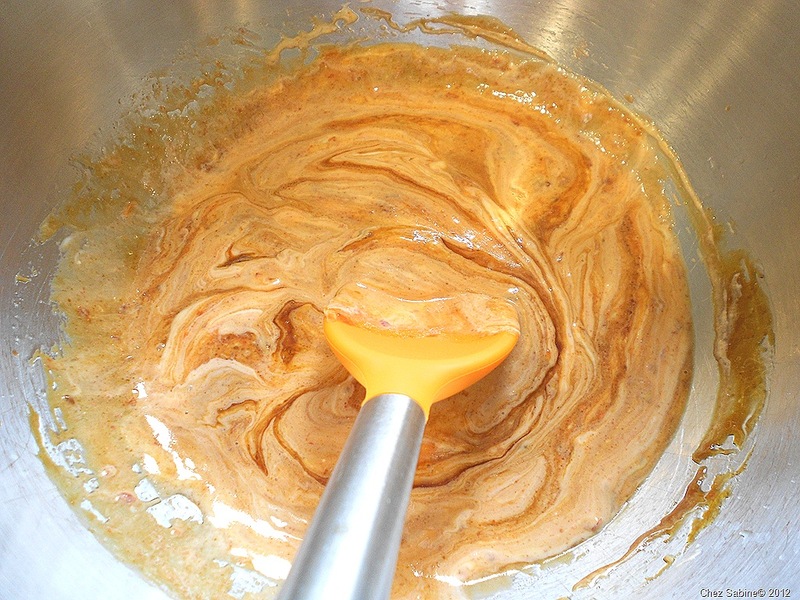 Add some cumin or ginger, or be really brave and put in a pinch of cinnamon. Morocco, anyone? Go in a totally different direction and add fresh garlic, dried oregano and olive oil to the yogurt and leave everything else out, except the salt and lemon, and include the zest. See? Now you’re in Greece. Mix all of the ingredients together. 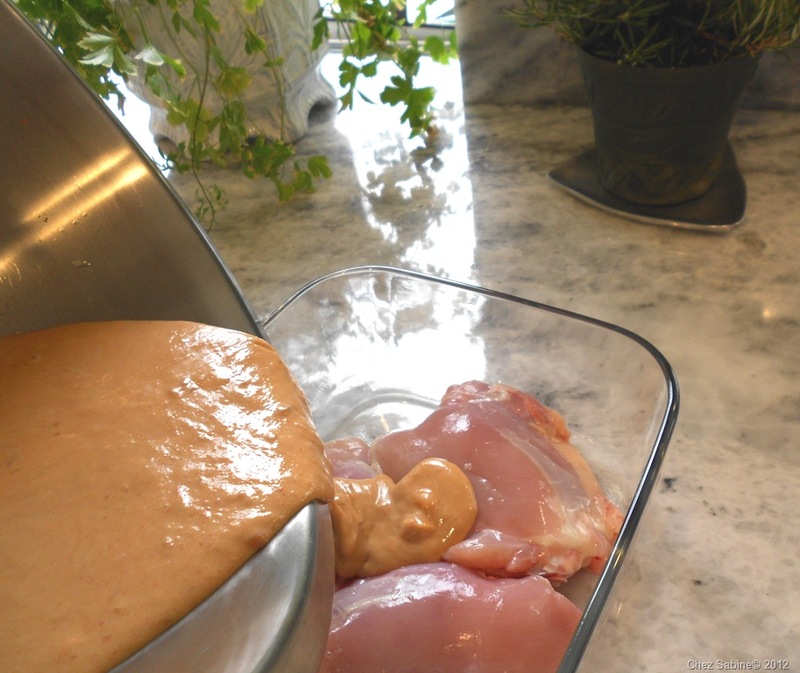 Pour over chicken, coating both sides. 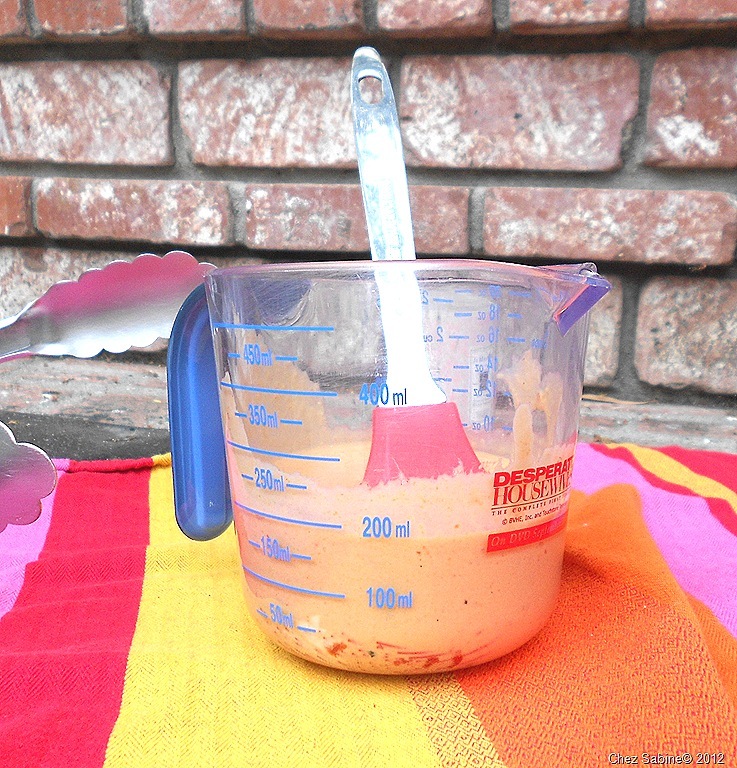 Cover and refrigerate for at least five hours. 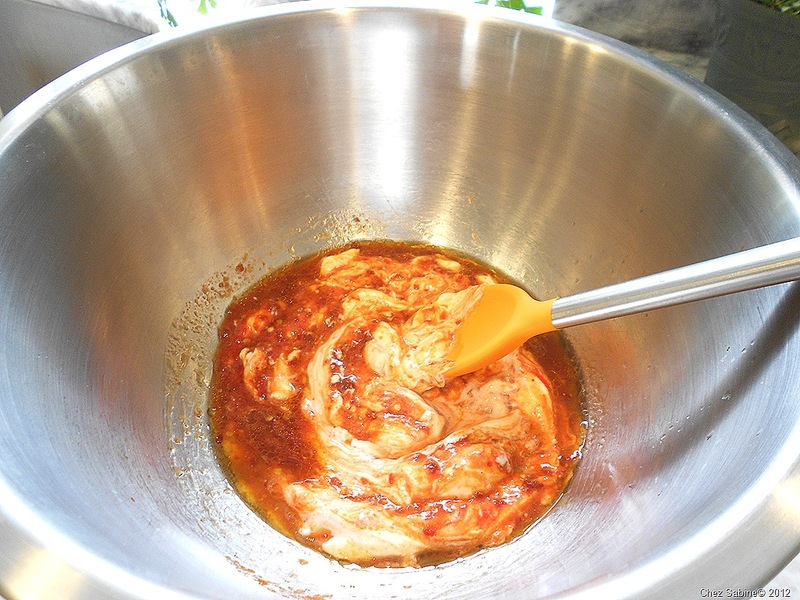 This is enough to marinate about six large pieces of chicken. My favorite pieces are skinless bone-in thighs. But you can use breasts or drumsticks if you prefer. Make sure to adjust your cooking time to the cut of meat you’re using. For instance, my bone-in thighs will take about 25 minutes, but if you use boneless thighs, they’ll cook in about half that time. 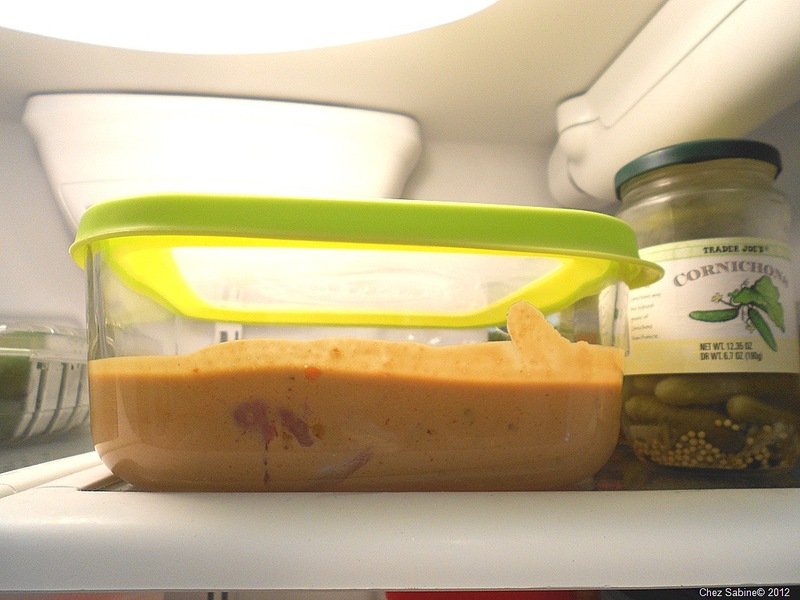 Cover and stash the marinating chicken in the fridge for about five hours or overnight. I don’t grill the chicken over high heat, but I do let my grill get to about 500 degrees before adding the chicken. But just before placing the meat on the grill, I lower the middle burners to med-low and leave the two outer burners on about med-high. The meat cooks on the middle burners, and the temperature stays around 450 degrees. I keep the grill covered most of the time. 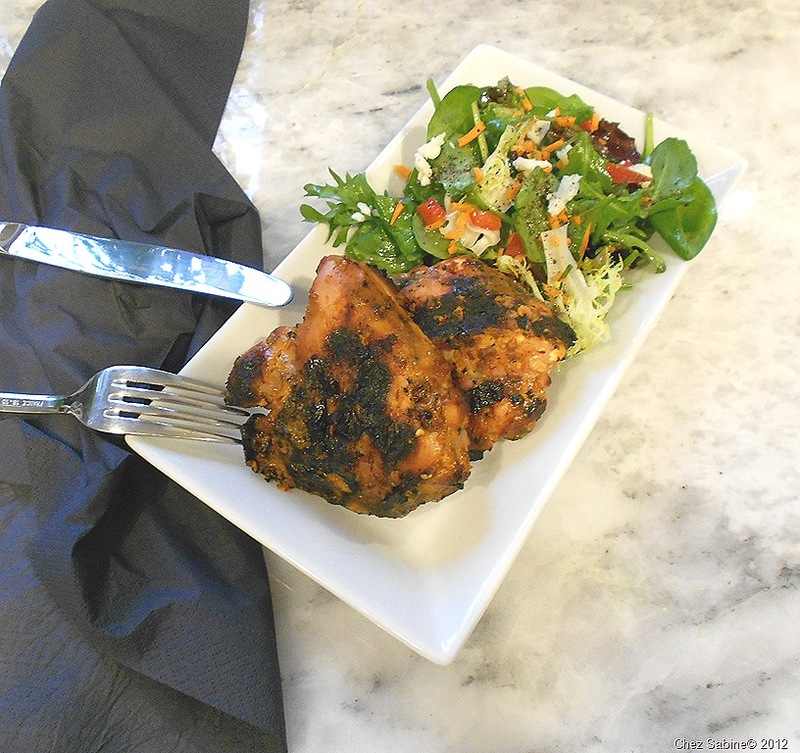 If there’s leftover marinade, I pour it in a cup and use it to baste the chicken as it cooks. 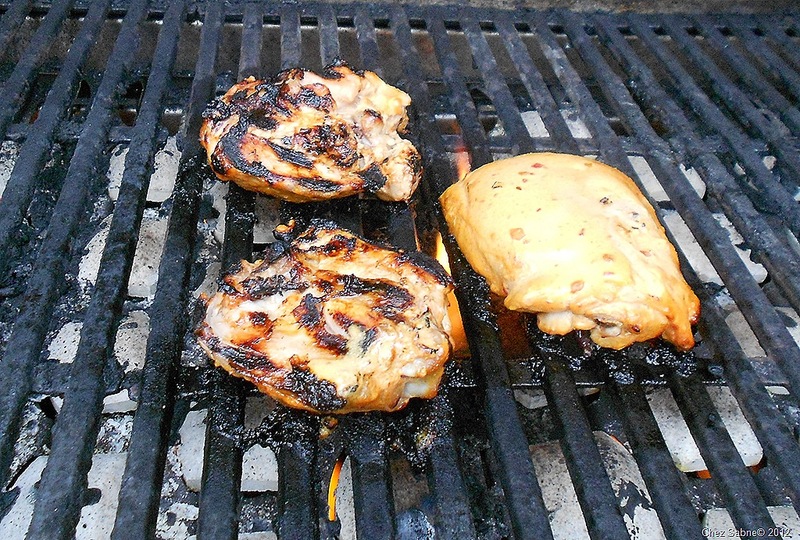 Remember that you can’t reuse the marinade because it’s been in contact with raw chicken. Also, make sure you wash your tongs after you’ve flipped the chicken. I’m salmonella phobic, it’s true. The chicken should be ready to pull off the grill after about 25 minutes. And there you have it. 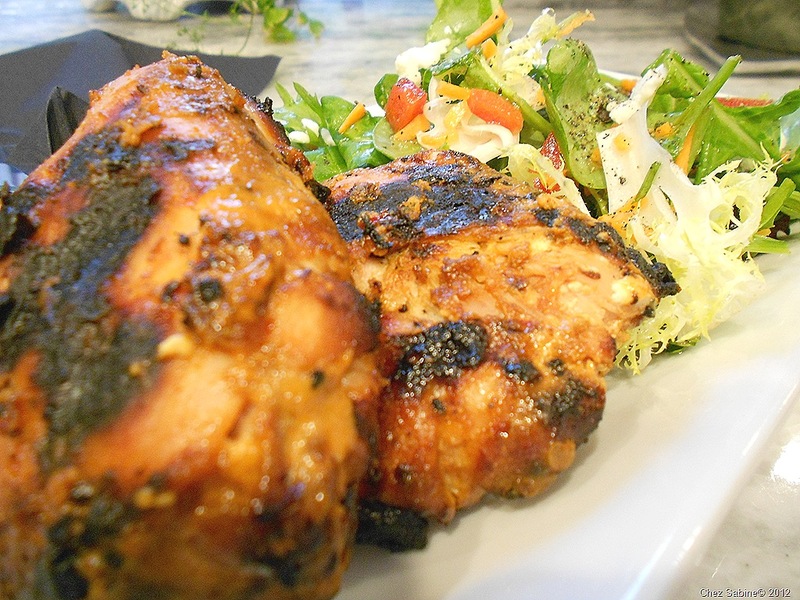 Grilled chicken marinated in spicy yogurt – or whatever you like. 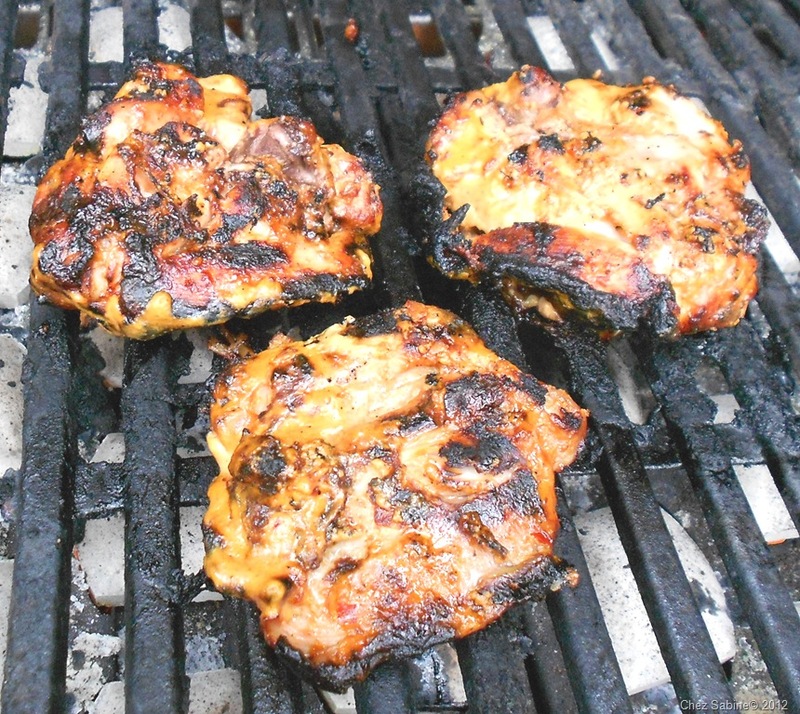 I hope you experiment with this marinade and let me know what you think. And what you come up with. Check out the video and you can hear the sizzle and almost smell the killer aroma. Let me know how you like it, Laura. I sometimes add Korean bbq sauce and extra garlic for a nice kick. I suspect most doctors would find it ok since there’s not much evil in it. Thanks for reading! Enter your email address to follow Chez Sabine and receive notifications of new posts by email.